What real-world difference does this testing provide? Instrumentation used for diagnostic testing must be maintained in good operating condition and undergo routine calibration at least once a year. There must be routine inspection and testing for electrical safety of all existing equipment. Here’s a test report from a trans-vaginal probe that was actually in clinical use in a major west-coast medical center. 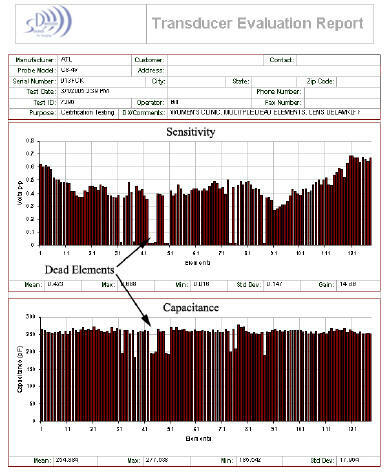 Look and the element sensitivity graph. Notice that a number of elements are low sensitivity or zero sensitivity. The corresponding capacitance graph tells us the elements are dead. The image did not show any area of missing data because the ultrasound system averages the data acquired from at least 12 to 16 elements to form each line of the image. The clinical quality of the images made by this probe were said to be marginal, but prior to testing the probe, the source of the problem was non-specific. Poor Depth Penetration : dead elements cause the acoustic output to be lower than normal. Reduced Signal to Noise : the user is forced to increase the receiver gain. This can fill cystic areas with noise so they disappear on the image. Poor Lateral Resolution : the system requires a signal from each element to accurately focus the acoustic beam. Poor Doppler & Color Flow Sensitivity : resulting from reduced transmit levels and fewer available receiver channels. The good news in this case, the transducer was covered under a service agreement with the manufacturer. This report and the transducer where handed to the service engineer and a new probe was provided at no cost. 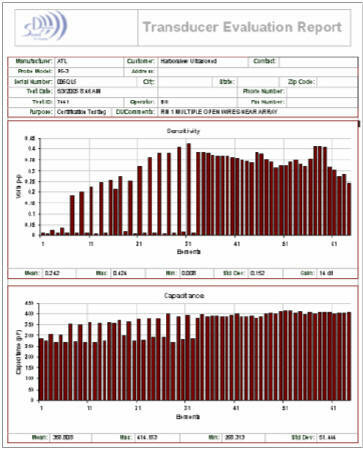 This test report is from an phased array, neonatal head probe in clinical use in a major west-coast medical center. Look and the element sensitivity graph. Notice that a number of elements on the left half of the array that are low sensitivity or zero sensitivity. Also notice that virtually every-other element on the left side of the array is missing while the corresponding capacitance reading is about 80% of normal. This tells us that the array is good and the wires for those elements are broken. The image did not show any area of missing data. Phased array imaging combines and averages the signals from each element to form each vector of the image. Open wires add noise, not signal, to the image. In this example, the image was formed from a probe with ½ the specified number of elements. The good news in this case, the transducer can be repaired by reattaching the open wires. This report was used to make the cost-effective decision to have the probe repaired vs. replaced.